If there is any justice in the world, Teenage Head would have been much bigger stars than what they are today. They had the looks, they had the songs, they had the sound but they just didn't make it worldwide, or at least in the United States. Some call them the Canadian Ramones - probably because of their short, sharp and catchy tunes, all delivered with a punk swagger - according to the wikipedia, they were one of the most popular Canadian punk rock bands during the early '80s. Thanks to newyorkdoll, who shared these very good soundboard tracks (taken from the rare 12-inch bootleg vinyl record, King St Teddy Boys), fans who once pogoed to the group can re-live those heady days once again. Kicking off this collection is Picture My Face, the group's 1978 single, but fans unfamiliar with Teenage Head might prefer to sample the groove-y Kissin' The Carpet or the-let's-all-sing-along-to Ain't Got No Sense. Meanwhile Wild One shows how adept the group was to rockabilly. newyorkdoll noted: "I discovered this boot after reading a rave review of it in last month's issue of Maximumrocknroll Magazine and tracked it down (no easy feat!). I didn't add any EQ or compression to these tracks - I just took the sound straight out digitally with my fancy turntable and tweeked the levels a bit. I'd rate tracks 1 to 5 and 8 to 12 about a solid 9 on the quality scale and tracks 6 and 7 about a 7 (slightly 'hot' on the vinyl). This is an excellent record for all of you Teenage Head fans out there... Turn it up!" Tracks 1 to 5 - Thunder Sound, Toronto, Ontario, Canada, October 31, 1978. 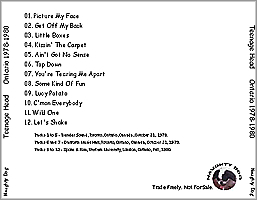 Tracks 6 and 7 - Danforth Music Hall, Toronto, Ontario, Canada, October 31, 1979. Tracks 8 to 12 - Spoke & Rim, Western University, London, Ontario, Fall, 1980. 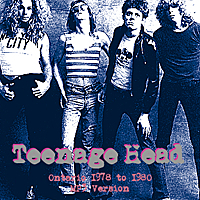 Click here to order Teenage Head's debut album.